I’m not sure if we can say that we’re in a Steampunk Renaissance, but two recent strategy games, Frostpunk and They Are Billions, make the case. Both games use the aesthetic in their own way to show a vision of post-apocalyptia, and both seem (either subconsciously in the former or consciously in the latter) to make a comment on its tumultuous historical inspirations. As I wrote in my piece about They Are Billions back in January, steampunk is an aesthetic movement with a weird mish-mash of varying inspirations, from Victoriana to the 1980s obsession with the neon future of cyberpunk. The result is a strange half-child tied to the aesthetics of an imagined past but grappling with the adventurous technologies of a new and unknown future. They Are Billions, in its constant colonization of zombie-ridden land, looks outward, but Frostpunk feels tight and inward-obsessed, with your settlement built out radially from a central generator, the only source of heat in a world bereft of the sun. Frostpunk is less about the conquest-driven expansionism that formed the backbone of They Are Billions, and more about the city. “The city” is, also, a generous term. Most of your settlements in Frostpunk rarely break a couple hundred inhabitants. Citizens are packed into the few tents or bunkhouses available, and life is a dull trudge of tightly regimented work and rest. Your position is not a war commander, as in They Are Billions, but the overworked city ordinator. Make no mistake, Frostpunk is fascist. It is fascist in a boldfaced way, the fascism of survival, the fascism that is “the only good option.” It is refreshing in its honesty. While I enjoyed They Are Billions greatly, it never felt like a game where I could indulge the interiority of the city. You were not concerned with the populace, but the constant war effort, the feverish expansionism. They Are Billions plays to one fantasy of steampunk—the untapped wilderness, the wild and unknowable denizens that you have the power to slaughter indiscriminately. It is brutal and brutish. It is freeing in the way that only total war can be freeing. By contrast, Frostpunk feels obsessed with the other steampunk, the one most similar to its cyberpunk heritage. It displays a Victorian perspective on the moral virtue of work, and the ideologies that flourish in a world where labor is virtuous. There are two primary ideological paths offered in Frostpunk as the game proceeds: Order and Faith. Order deals with the authoritarianism of policing, of the eventual panopticon state. Guardsmen wander the streets, laws are strict and punishments brutal. Jails and forced labor are commonplace. The Faith path is concerned with the authoritarianism of the Church, of a belief system so omnipotent in daily life that Faith Keepers take the place of guards, and public punishments in the form of ritual harm become common. Both paths begin rather harmlessly, as all fascism does. Order begins with start-of-shift meetings in each workplace, to rally for the day. Faith builds churches, sanctums from the cold and spiritual rests for each citizen. It is only through the overbearing moralism around who works and how work is assigned that each path begins to grow fangs. There are no “good cities” in Frostpunk. But there are cities. The future, says Frostpunk, must have these civilizations. It is either that, or apocalypse. 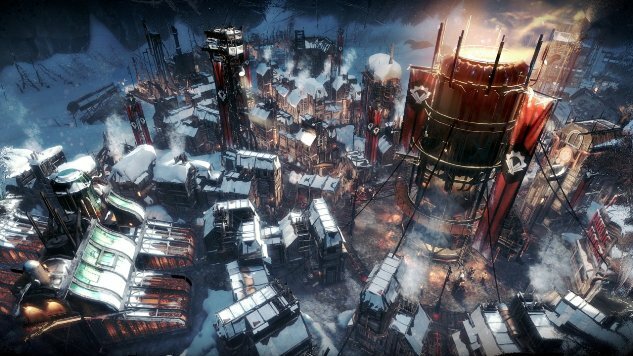 This is the other way in which Frostpunk reflects the early industrialization of the European colonial era: the primacy of the city is not due to any inherent virtue of the form, but because the city is stratified, populated, and most of all controllable. Industrialization could lead to more output from the same physical footprint as older-style artisan houses or craft guilds, and unlike those more cooperative spaces, an industrial factory was overseen and could be more strictly designed. The boss became a new god, and thus even the church had to pay tribute to the head of production. Work, and labor, is a constant in Frostpunk. I have long thought that most works of steampunk are not worthy of the “-punk” suffix as they do little to critique the systems that they reflect. Even They Are Billions in its grotesquery does not comment on the workers’ livelihoods, or the hardships of settlement life. Frostpunk (fittingly for the name, I suppose) feels ever-critical of the Victorian order, and of the ideologies that took root in its obsessive drive toward production and expansion. For even in its smaller footprint, Frostpunk is about expansionism, but an expansionism of complexity. Your city grows from a small hamlet of tents to a small hamlet of workshops, cramped bunkhouses, and understaffed medical care centers, and each building in the rings outward from the generator are pushed as close to one another as possible. No one wants to expand. Everyone knows the heart of the city is the safest. Because the city is everything. There is no win condition in Frostpunk that particularly cares about the safety or the lives of the people in the city. It is always about the city, the monument to a civilization long frozen over and lost to the past. It is distinctly “punk” in a way that many steampunk works are not. There is no illusion that this city is “good”. But it is familiar. Even now, the values that took root in the early industrial era still feel intrinsic to America: work is good, control is natural, industry is inevitable. By the end of a campaign in Frostpunk, I am relieved. But I am not proud. Dante Douglas is a writer, poet and game developer. You can find him on Twitter at @videodante.